Today I was able to attend a meeting with my creative team brainstorming ideas to make one of our conventions impactful for the physicians who will be attending, while helping to grow our business. I loved the vibe…we were all standing amongst an open, collaboration space; bringing ideas to the table; laughing and being serious all at the same time. I was reminded of the good that can come when you allow boundaries to drop, don’t bring a perceived right answer to the table, and allow for freedom of thought and discussion. It reminded me of a quote from a great book I read earlier this year and am thinking that I need to go back to study again: Creativity, Inc.: Overcoming the Unseen Forces That Stand in the Way of True Inspiration. Catmull uses this book to share the lessons he learned as the co-founder of Pixar as they grew from an idea to a widely successful movie studio. He is passing on great advice to those of us who want to bring creativity into business every day. These Braintrust meetings were a gathering of most talented minds at Pixar that reviewed projects and ideas to help make them successful. What I love about this quote, and what I felt today in my meeting was the collective group of brains that were coming together to make something better. What made this stand out is that so often I feel like within my marketing team individuals feel like their idea is the best idea. They have a lack of willingness to share their idea for fear of it being taken, critiqued, or worst-case shelved. Todays meeting, and the fundamental premise of the Braintrust concept, is that ideas flourish with discussion, debate and commitment from individuals to deliver excellent work. So, a commitment for the week. Build a culture on my team that encourages creativity through discussion. Help people learn to realize the strength in sharing their ideas so that the ideas become better. Yesterday, after a long day at work, as I was playing with my kids at the park, this quotation that I found a few months ago came to mind. I found it on a particularly rough day….one where I had been dealing with crazy political issues at work which caused me to stay late and miss most of the evening with my kids. It seemed like I was realizing in real-time that I just couldn’t do it all. That night, I felt ready to fold, ready to give in. I got them to bed and spent a bit of time reading and trying to get my head around what to do next to stop feeling this way. And, I happened upon this quote. One of my personal principles had always been to “reach for the stars”. I have always believed that in doing so, I stretch myself to make the best things happen no matter what hand of cards I have been dealt. 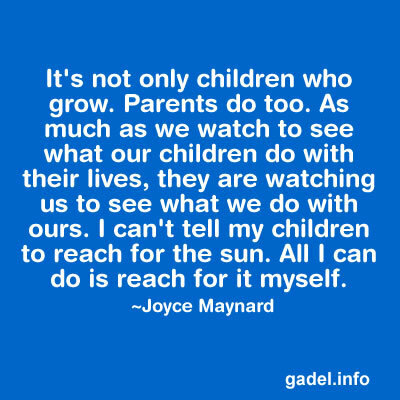 Reading this quote, this was the first time that I had thought about the impact my “reach for the stars” philosophy had on my kids. It helped me to realize that the act of me stretching myself was helping them learn that they could too. Often with our kids Jon and I use the saying “never give up, never give up” to cheer them on when they think that they can’t accomplish something. It is a line straight from “Dora the Explorer”, the most quality television programming we seem to watch these days. Ironic that we say this to our kids, but sometimes feel like we can’t live it ourselves.